The modern American family faces many pressures. Often fragile marriages or parent-child relationships are held together by little more than band-aids, paper clips, or rubber bands. Such makeshift repairs only work temporarily. Good News! The Word of God offers more than temporary fixes for these human struggles. There is hope for your home life no matter how serious the problems or how deep the conflicts may seem. God’s Hope for Your Home explores the biblical essentials for maintaining healthy family relationships and living with a godly hope. “Keeping the Word of God at the center of the family circle is not something that can be done part time like a hobby, nor is it an easy goal. 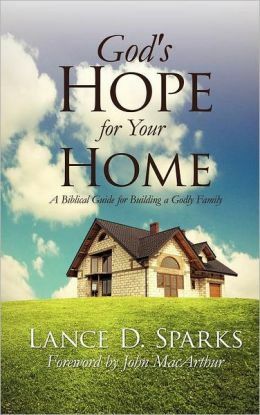 Lance Sparks has given families a practical and helpful head start with God’s Hope for Your Home. I’m grateful for his clear, readable, engaging exposition of so many biblical principles that have direct application to family life. Whether you are a new parent or a seasoned grandparent, I know you will find this book supremely helpful. I’m delighted to see it in print, and I hope it will motivate and encourage Christian families for generations to come.” – John MacArthur.